BurgerClub is committed to finding Winnipeg’s Best Burger and have set aside a year to do it! We’re just over halfway through our enviable mission and thought it would be a good time to summarize what we’ve learned so far. ««««« The Peppercorn Bacon Burger was delicious and Burger Club’s overall #1! 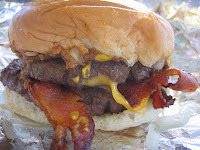 The bacon was chopped up into perfect little bite sized pieces, fried to perfection and covered the top of the hand formed patty. The overall flavour was very well balanced. It comes as a platter and be sure to try the house salad. Charlee’s is also highly rated on value - the platter was only $7.89 and they know how to treat you right there. The service was great. Cary: Charlie’s peppercorn bacon burger with the bacon cooked into the side of the burger was truly inspired by the Burger Gods! ««««« The beef patties were free-range-hand-squished, thick and dense. A single burger is all you need - a double overwhelms the flavour. 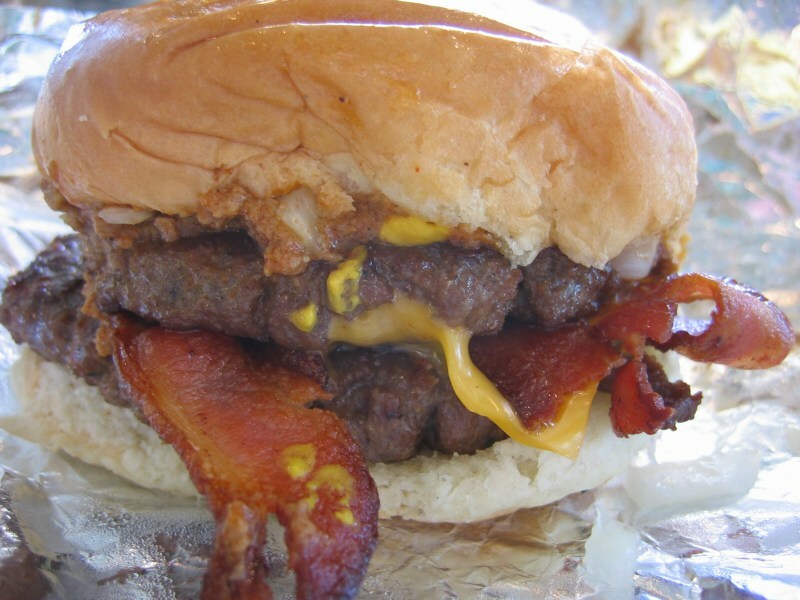 The bacon burgers came with four - yes four - slices of perfectly fried bacon. If you order fries they come in a Styrofoam container with the fork impaled in the lid. The service was very fast - everyone got what they ordered and we received our food all at once. The Fat Boy is a meager $4.25 giving Zax a high value rating. Kari: If I say it loudly enough, maybe I can sway others Zax. My most favourite cheeseburger. Everything works with this one. The patty is flavourful, the bun awesome and the overall taste and texture made me want to start all over again and enjoy it twice. Brett: Zax or Dairy Delight or White Star. I guess I have to give it to Zax as I have been back twice since. Isn’t that really the determining factor? I don’t think it is just the convenient location. I think it is quantity, flavour, price and service that makes this a place that you head to and know all the bases will be covered in a reasonable amount of time. ««««« If you live in St James you’re lucky because you’ve got your choice of great burger joints! The patties were thick and juicy and very lightly seasoned - soft but not mushy. 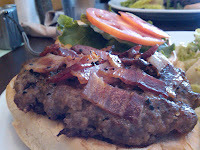 The bacon was crispy and had lots of flavour and it was a very well balanced burger. When you go, order a milkshake - they were awesome and great value for the size. 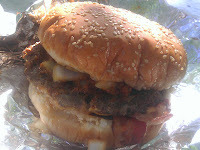 The Fat Boy was inexpensive at $4.45 and it was a big burger. Burger Place also received a high rating because the service couldn’t have been friendlier and the burgers came out fast. ««««« Everything just worked to make the White Top our #2 burger. The beef patties were juicy and soft without being crumbly and had nice flavour. The chili tasted like real chili - meaty with a nice bit of spice. Those that had the Fat Boy enjoyed a nice ripe tomato and enough shredded lettuce to make a side salad. There’s nowhere to sit, but the White Top has a drive through. The service was friendly and quick and with the Fat Boy being only $4.45, the White Top received the second highest value rating too. 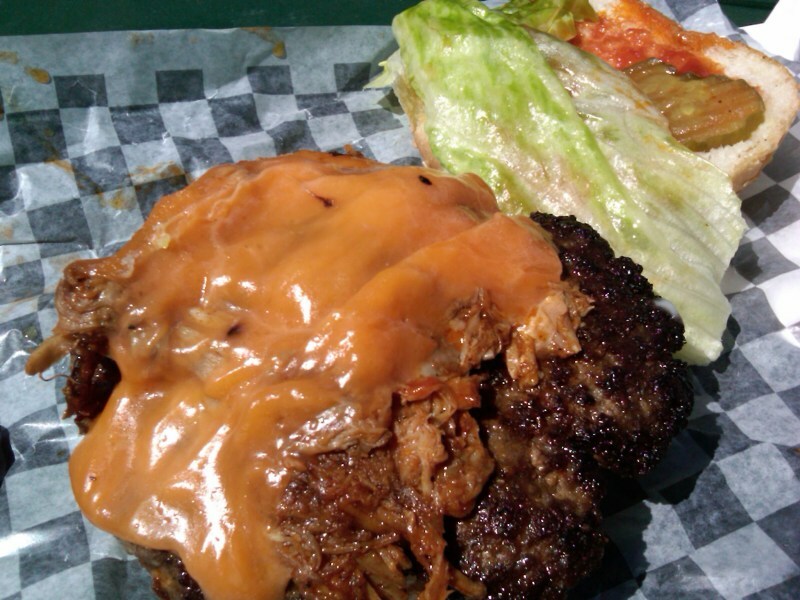 ««««« Don’t even consider any burger but the Mortimer topped with pulled pork and a slice of real cheddar cheese! The basic Fat Boy is inexpensive at $4.75 but the Mortimer is worth every penny at $8.35.Couple it with a great milkshake and you’ve got yourself a meal. One of the nice things about the White Star is you can pre-order and pick up your waiting food at lunch. There’re only a couple of seats inside but in the summer you can picnic in Market Square. «««« The new Build-a-Nip is not the Nip of old - it was delicious! The Build-a-Nip burger came with a nice large, beefy tasting patty that filled the bun to its edge. It was coarse ground and quite juicy - more watery than fatty. The bacon was delicious - crispy to perfection! Don’t order the mushrooms though - they come from a can. Also, the “cheddar” cheese is a processed cheese slice. Sals is famous for its Red Velvet Cake and it's still plate-licky good. The service was quite possibly the slowest I’ve ever experienced so don’t be in a hurry. Kari: Okay, repeating myself but I must say that the Salisbury big Nip more than surprised me. 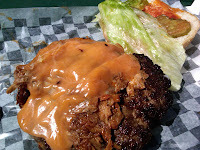 After trying one of their burgers at a Goldeyes game, was sure I would hate this one. Nope. It was great. The service at the Esplanade was abhorrent, but the burger and the view made up for that. I will eat one again. «««« The burgers are flame broiled, but the fairly inexpensive, pre-fab patties brought the rating down. They’re priced accordingly though, and the Burger Factory had by far the best value burger with a Fat Boy selling for $3.35! You get to choose your own toppings - which is great - but possibly the best thing about the Burger factory is George! Dani: I’d have to say that my favourite burger to date has been the Burger Factory burger. Largely because of the freedom to have the burger constructed exactly how I wanted. Paired with that the size of the burger and bun and flavour, I think it’s a winner all the way around. I’d also like to give honourable mention to The Nook for the quantity of bacon that came with the burger and Charlee’s for the flavour. April: If the burger I had at Original Joe’s were a man, I would marry it. Second to that was A&V Drive in good value and flavor. 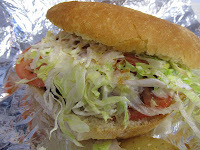 Editor’s note: Original Joe's is Burger Club’s #3 burger but didn’t make the top picks because it’s an expensive burger! Mike: The Drunken Aussie at Unburger: I didn't know what to expect when I saw the name. In Canada, we have this Maritime Song, 'what would you do with a drunken sailor'... That's what I thought of when I ordered it. It really was as if some drunk guy grabbed whatever he saw in his fridge and slapped it on because he was hungry. Despite the name and the odd list of ingredients, it was a pleasant surprise and one I wouldn't hesitate to order again. Great name, great flavours and a lasting impression. Karen: I remember my first time at Luigi's. I had the Luigi burger and I ate the whole thing. It was as big as my head and super tasty. This was all before burger club was burger club. Since then my favourite burger is still Zax burger, featuring a hand made tasty burger and well balanced ingredients. Zax was a good burger day. Editor’s note: Luigi's is Burger Club’s #5 burger but got beat out by Zax and Burger Place on value. Russ: Clearly my favourite burgers: The Mortimer from the White Star Diner and the Sicilian from Original Joes have one thing in common... more meat to go with the burger. They also both have real cheddar, a shiny bun, and hot serving staff. Oh wait that wasn't true at the White Star. You know, he's cute and all but I don't swing that way. No mention was made of the WORST restaurant, because the person in charge of the blog is too nice. Black Sheep Diner wins that dishonor, without any arguement. The food is okay, but the staff is absolutely terrible. I left unfed and fed up! What is the full list of all the places you went to?